Okay, so I mentioned that we were given a gift of plums. Lots of plums. I am thrilled, of course. It is lovely to receive such a wonderful gift. It is nice that there this person who has a very fruitful tree, who knows that she can't use all of the fruit, and who wants to share it with friends. It is also wonderful that there is this other person who has become obsessed with saving every living piece of vegetable matter in the world and using it for the greater good. And therefore she can't say no to saving the plums from rotting into the soil under the tree. It's just that I think I have a problem. I keep reading things that tell me how important it is to eat and feed my family organic produce. And how imperative it is to eat things that are in season and locally grown. How doing this will save the environment, protect against cancer, insure that the labor force on the farms is protected, and allow me to enjoy amazing quality fruits and vegetables in their prime, the way they are meant to be enjoyed. I also read about how the USA is exporting potatoes... and importing even more. And how there are people starving all over the world, because we are growing (and purchasing) huge industrial crops, which have to be altered to be edible, instead of growing food that we can eat and letting everyone else grow food that they can eat. Okay, so all that adds up to the fact that when there is a piece of fruit, grown in my own neighborhood without pesticides, and there is no fuel consumption or labor force or huge conglomerate corporation to feel guilty about, I feel like I have found the holy grail. It feels sinful to waste the very thing that I am searching for. Never mind that fact that there are about 700 holy grails in my kitchen right now. I can save each and every one of them. I can!! So, this week it is the plum. We canned and baked and froze and ate 23 pounds of cherries. Then we canned and cooked and ate close to the same amount of apricots. And now, we have plums. Remember when I talked about stone fruits? And how there are clingstones and freestones? And how the apricots are so fun and easy to work with because they are freestones and the pit practically jumps out of the fruit? Well, meet the plum. The clingstone plum. Here is the irony: If a plum is ripe, it is so amazingly soft and sweet that you want to freeze forever the flavor, scent, and texture. But, the fruit clings so forcefully to the pit that you also want to curse and cry and hire someone to get the fruit out for you. On the other hand, if you can get to the fruit before it gets quite so ripe, the pit is a little easier to get out. Of course, the fruit is tart and makes your face squinch up when you eat it. What is a plum eater to do? Use the different stages of ripeness for different purposes, and just accept that the path isn't going to be easy, but the destination is all worth it. Like many things in life, it is worth working for. Here is an almost-ripe plum cut in half. See how the stone is pretty much free of the fruit? But the fruit is pretty firm still, and not very juicy (or sweet). Here, on the other hand, is a very ripe plum. The fruit clung to the pit, and almost none came off with the peel. But it sure is nice and soft... and sweet and juicy! This very ripe plum will require some effort to get the pit out. My recommendation is to use these very ripe fruits for sauces and jams, because the fruit all gets mushed up together anyway, and it doesn't matter how much you mangle it in your efforts to get the pit out. Save the lesser-ripe fruits for recipes where you are going to want pieces of plums to look like pieces of plums. 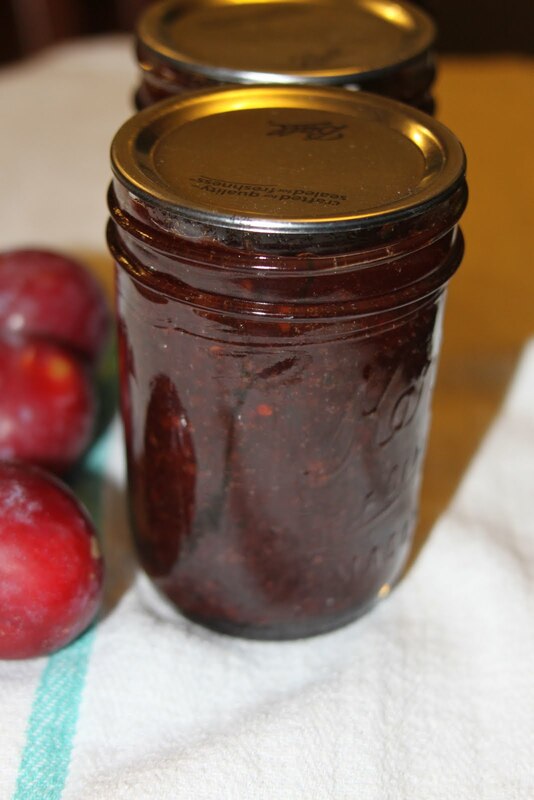 The first thing I did with the plums was to make plum sauce... the sauce that is used in many Asian recipes as a base for stir-frys. I LOVE plum sauce, and it makes meals very easy to put together on busy weeknights. Having a few jars of this in the house is going to make life much simpler in the months to come. Tomorrow I will give you one suggestion of how to use plum sauce in a very simple, quick stir-fry dinner. For now, though, we must start by making the sauce. I actually tried two different recipes, and one seemed so very far superior in the final flavor that I am not going to bother giving you the other recipe. I selected the darkest and softest plums for this sauce. I wanted to get to them before they rotted, and it worked well to have them mushy in cooking this sauce. I started to cut them in half and twist apart the sides, but they were so soft and ripe that I ended up just squeezing the pit out with my fingers, and trying to pull as much fruit off of it as possible. You want a balance of the sweet fruit and the tart skin for this recipe, but in cases where the plum was so ripe that the fruit easily slid off of the skin, I went ahead and threw out the skin. I probably used about half of the skins in the long run. Other than getting the plums pitted, and measuring out ingredients, this recipe is very easy (although time-consuming). Combine all ingredients in a large stockpot, and cook over medium heat for about 1 1 /2 hours, until thick and syrupy. Fill jars, leaving 1/4 inch headspace. Wipe rims of the jars, place lids and rings (fingertip tight) and process in boiling water for 15 minutes (adding time for elevation). Turn off heat and let jars sit for 5 minutes before removing from water bath. Remove from water and let sit, undisturbed, for 12 hours before touching. Come back tomorrow for a suggestion for using the plum sauce!